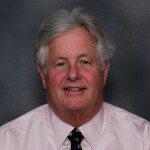 After nearly 46 years of service with HB Communications, Inc., Bob Anderson retired April 1, 2012. He was honored at a surprise party with over 160 employees and affiliates in attendance. He received accolades from HB partners and the management team. Bob Anderson started at HB in September 1966 and April 1, 2012 marked his retirement from the company. North Haven, CT, June 1, 2012 -- After nearly 46 years of service with HB Communications, Inc., Bob Anderson retired April 1, 2012. He was honored at a surprise party with over 160 employees and affiliates in attendance. He received accolades from HB partners and the management team. His many years of service were recognized, “If I hadn’t had a reliable partner like Bob, HB wouldn’t have become the success it is. Bob understood me and I understood him. We got along by playing off each others' talents,” said Mackey Barron, president and founder of HB Communications. Anderson joined HB Motion Pictures in 1966 when Barron initially hired him to work in the warehouse. There were less than 15 people working out of the 2,500 sq. foot office on Audio Lane in New Haven, CT. In this small company, everyone shared job responsibilities and Anderson advanced quickly. Soon he was responsible for the service and rental departments, as well as coordinating delivery drivers. Anderson noted, “People were motivated, they had good direction and wanted to help the company grow with new advances in technology. Everyone did double duty and multi-tasked which played a role in HB’s success. Having the opportunity to learn from the ground up gave me a deep understanding of all aspects of the business and company operations.” In the early years, HB sold audio visual equipment to K-12 schools and higher education institutions. Types of equipment included phonographs, projectors, and audio tape recorders. HB represented the major companies of the time: Bell and Howell, Eastman Kodak, 3M, Viewlex, and Califone. It was an exciting time of opportunity, rapid growth, long hours and business success for Anderson and HB. By 1975, Anderson was involved with inside and outside sales. New manufactures were coming to the forefront in response to TV and communication technology advances. Anderson helped direct HB’s reaction to the changing industry by recognizing Ampex as the first major player to distribute video tape recorders. He had brought the Ampex vision to HB as an up-and-coming technology in the education market and Barron supported this decision. This was a major part of HB’s growth. Other manufacturers followed suit and created business relationships with HB. This included: Sony, Panasonic, Hitachi, and JVC. Educational institutions began to offer courses in television and mass media communications. During this time HB Motion Pictures changed its name to HB Educational Systems. When the oil embargo hit the US, it drastically affected the technology budgets of HB’s customers and almost put the company out of business. Anderson, who became a partner in the 1970s, was instrumental in helping HB change and expand to sell to corporate and government accounts. This led to a decision to change the company name to its present HB Communications, Inc. By the early 1980s, HB was becoming more involved in Fortune 500 companies. Now vice president of sales, one of Anderson’s accomplishments was signing up with Sony as a broadcast dealer, which solidified HB’s presence in the broadcast market. HB quickly became the number one broadcast dealer in New England and the company doubled in size. As the company grew, so did the need for space and Anderson was tasked with finding new offices. Still needing to keep a large manufacturer inventory and increase the space for integration, he found a 25,000 sf property at 15 Corporate Drive in North Haven, CT. He was also responsible for locating a site for the new HB division in Boston, MA. The rental department was also booming as customers looked to rental options instead of expensive equipment purchases. In 1988, Anderson helped found HB Group, Inc. as its own entity. HB Group provides AV solutions to improve live events by enhancing audience engagement through the use of video, sound, and lighting, with the best technical staff in the industry. In the 1990s, LCD projectors, CRT video projectors and computer integration systems were now HB’s main business being sold to educational institutions and organizations. In 1999, the company found a new office space with over 90,000 sf at 60 Dodge Avenue, North Haven, CT to hold both companies and employ over 300 people. Through the years, Anderson was responsible for hiring many of HB’s key employees, department directors and management team, most still employed with the company. Retirement plans for Anderson include dividing his time between his homes in Connecticut and Vermont. An avid outdoors man and equestrian, he plans to go on many adventures with his horse Ready and spend more time with his wife, children and three grandchildren.